Kal Kolter[Notes 1], known as Shoichi Kusanagi (草（くさ）薙（なぎ） 翔（しょう）一（いち）, Kusanagi Shō'ichi) in the Japanese version, is a character appearing in the Yu-Gi-Oh! VRAINS anime. Operating out of a food truck called Café Nom, which doubles as his and Yusaku's base of operations, Kolter is an ally of Yusaku Fujiki in his fight against the Knights of Hanoi, with integral knowledge of the LINK VRAINS. In both versions, Kolter is usually known by his surname. Kolter is a young man with fair skin and grey eyes. His purple hair comes to the base of his neck, and it has multiple small bangs brushed over to hide his forehead, and he also sports a small goatee. Kolter dresses simply, wearing a brown trench coat over a purple hoodie with a bronze zipper and light blue shirt, and teal pants tucked into burgundy boots with prominent black soles. Kolter is a rather friendly individual. He's shown to be sympathetic towards Yusaku and hopes he can one day enjoy Dueling again. He also regrets dragging him into the fight against the Knights of Hanoi. Behind his friendly easy-going nature, Kolter harbors an intense anger and hatred towards the Hanoi Project just like Yusaku, though he doesn't actively show it unless triggered enough, like when he listened to Akira Zaizen talk about the possibility of Skye being kidnapped. Kolter angrily stated that Zaizen didn't truly know what the horrible trauma he felt was like. Being the owner of a food truck, Kolter is a capable cook; he was seen cooking hotdogs. Like Yusaku, he is a talented hacker. He was able to get information about SOL Technologies' activities and helped Yusaku capture Ai in the latter's Duel Disk. He was also able to figure out that Skye Zaizen is "Blue Angel". On several occasions, he has hacked surveillance cameras in both LINK VRAINS and the real world alike with little effort. He is noted to routinely erase footage, article, and images of Playmaker in the network. Ten years ago, Kolter's younger brother was kidnapped for the Hanoi Project in the past. Even though his brother was rescued, he still suffered intense PTSD that he apparently never recovered from, prompting Kolter and Yusaku to fight against the Knights of Hanoi, whom they believed to be responsible for the incident, to get revenge. Kolter and Yusaku discussed SOL Technologies and Hanoi's recent movements. Kolter told Yusaku about the Data Storm and suggested that it could help Yusaku enjoy Dueling again. He revealed SOL was looking for an AI on the run and that they were planning a full scan of LINK VRAINS to find it. Yusaku decided to capture the A.I. and use it as a trump card against Hanoi, and he closed Café Nom, despite Kolter protesting that he was expecting customers that night. The two hackers managed to capture the A.I. in Yusaku's Duel Disk during an attack from the Knights of Hanoi. Kolter was surprised when a Data Storm occurred when Playmaker challenged the the Knight to a Duel. He watched the Speed Duel, worried when Playmaker was sucked into a Data Storm tornado, but he was relieved when Playmaker won the Duel. Kolter and Yusaku spent the next few days trying to figure out the A.I. 's programming, but Kolter struggled to understand the complicated algorithms that it was composed of. He suggested coming up with a name for the A.I., and Yusaku decided to name it "Ai". He was impressed that the card data Yusaku obtained from the Data Storm was becoming a physical card. Trying to scan footage from "Ai's" memories caused the Knights of Hanoi's leader to track them down, but Kolter was able to shut down Café Nom's power before they were found. The next day Kolter gave Yusaku the "Decode Talker" card that had finished materializing before he went to LINK VRAINS to fight a Knight of Hanoi that had appeared. When the Knight turned out to be The Gore, SOL Technologies activated a program that prevented Playmaker from logging out. Kolter worked on an escape route for Yusaku, but Yusaku refused to use it. After the Duel ended, Kolter scolded Yusaku for not using the escape route, but also suggested that they could recruit The Gore for their fight against Hanoi. Playmaker refused, not wanting to drag Gore into their fight. Kolter discovered that the real identity of the Celebrity Duelist Blue Angel was Skye Zaizen, a classmate of Yusaku and the sister of SOL Technologies' security chief Akira Zaizen. 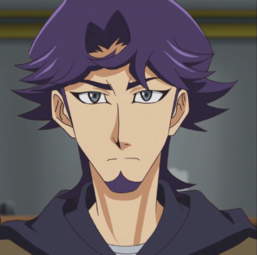 He suggested that Yusaku meet with Skye so they could get closer to Zaizen in order to get more information about SOL Technologies, but doubted the plan would work because of Yusaku's poor social skills. A few days later, he was shocked when Playmaker and Blue Angel began a Duel before getting interrupted by a customer. After the Duel concluded and Skye fell into a coma, Kolter hacked into the hospital's records to find out about Skye's condition. Ai explained that Skye had been infected by a virus from Hanoi's card, and that the only ones with the anti-virus would be Hanoi themselves. "Blue Angel" appeared, claiming that she wanted a rematch against Playmaker. Kolter knew immediately that she was an impostor and told Yusaku to ignore her because it was clearly a trap, but Yusaku logged into LINK VRAINS regardless because he felt it was his responsibility to save Skye. Varis's appearance and subsequent manipulation of LINK VRAINS caused Kolter's cameras to go offline, though he was briefly able to use SOL's cameras and later Ghost Gal's. He was displeased when Ghost Gal's camera stopped recording, preventing him from seeing how Yusaku was doing. To watch the Duel, Kolter used the bugs in the Knights of Hanoi's program that created the Data Storm to open a path for Ghost Gal to enter the Data Storm; she had her cameras record the Duel between Playmaker and Varis, allowing Kolter to watch it. Kolter learned of the Ignis, A.I. with free will that Varis claimed wanted to overthrow the network, but didn't believe that Ai would do such a thing. Kolter was relived when Playmaker was able to defeat Varis, and he carried him out of his pod after he logged out. Yusaku expressed interest in Skye's condition, so Kolter showed him that she had recovered. Yusaku fell asleep, and Ai commented on how lazy he was, but Kolter claimed heroes needed to rest. Ai started bragging, so Kolter began to analyze the program that he had stolen from Varis, prompting Ai to clam up. Yusaku woke up, murmuring about the Ignis, and Kolter noted that he was thinking what Varis had told them about Ai. Since they did not know how to prove if Ai was actually alive, Ai claimed it was indeed alive, and he used the program that he had obtained from Varis to recover his body. However, Ai's size didn't impress Yusaku and Kolter, who instead tried to analyze if Ai had regained some of his memories. A few days later, Emma Bessho came to Café Nom, but neither she nor Kolter recognized each other as "Ghost Gal" or "Playmaker's assistant". Emma ordered a coffee and two chili dogs and mentioned that she was interested in Dueling Playmaker, causing Kolter to wonder what kind of Duelist she was. Yusaku noted that Kolter looked exhausted, explained that he'd spent all night deleting "Playmaker" files and videos that people constantly posted on the network. Yusaku offered to help him with the clean up, and they spent the night deleting files, while Kolter noted that Yusaku was dwelling on Varis's words. During the night, Kolter called Yusaku to come to Café Nom and showed him an encrypted message from Ghost Gal; Kolter explained that he had created a program to navigate her to enter the Data Storm during the Duel with Varis. Ghost Gal had challenged Playmaker to a Duel with Ai as the stakes, offering a backdoor program into SOL Technologies as her barter. Kolter confirmed the program's legitimacy, as Ghost Gal had sent some of the data as proof. Yusaku asked Kolter to confirm that Playmaker would accept her challenge. Ghost Gal soon entered LINK VRAINS, and Yusaku went to do so himself. Kolter wondered if Yusaku would really go and Duel her, wary of another trap. Yusaku replied that he had to uncover the truth behind the Incident, hoping that the data bank contained some information about the Knights of Hanoi. Kolter watched as Ghost Gal and Playmaker confronted each other, and warned Yusaku to be careful. Kolter was baffled by how complex the Duel was, being unable to predict the outcome. After Playmaker won and obtained the program, Kolter began to analyze it, believing that he could crack the code. Kolter showed Yusaku his analysis of Ghost Gal's program: the backdoor entrance to the SOL Technologies' mother computer, whose schematics looked like a maze. Kolter and Yusaku were nevertheless impressed by Ghost Gal's skills in finding it. Kolter promised to be ready when the school was over, and Yusaku would be able to infiltrate the network the following night. That night, Kolter showed Yusaku the location of the data bank, warning that the path to it was filled with traps, though he had prepared countermeasures against them, and Yusaku praised him for his speed. After Yusaku logged into LINK VRAINS, Kolter programmed an device for Playmaker to hold onto to avoid traps and a rope to prevent him from being detected, and gave directions to Playmaker where to go. As security traps were set to stop Playmaker, Kolter programmed three "Sphere Kuriboh" as decoys. After Playmaker passed Area A, Kolter realized that there was a Data Storm in Area B, and he suggested turning back, but then admitted that the Data Storm wouldn't be as harmful if Playmaker continued on. After Playmaker defeated Prototype Green-A, Kolter navigated him to the data bank. Kolter watched as Playmaker confronted Zaizen, and as Zaizen claimed he would set things straight with the data, Kolter and Playmaker became furious, saying Zaizen understood nothing about them. Kolter watched the Duel, furious to be reminded that his brother was part of the Hanoi Project. He was shocked to learn that SOL Technologies' data bank contained the name of the mastermind behind the Project. Playmaker defeated Zaizen and logged out, and Kolter praised him for acquiring the data. The two hacked into Ai, and found out the Hanoi Project's leader was Dr. Kiyoshi Kogami, an employee from SOL Technologies, who worked on the Project alone in secrecy. The two concluded that SOL Technologies covered up the incident to prevent the company's reputation from being ruined. Ai doubted that Dr. Kogami could have done this on his own, and suggested that Zaizen was involved, but Kolter reminded him that Zaizen had only been 16 at the time and not employed by SOL Technologies. Kolter and Yusaku failed to find the project's goal in the data, but to their shock they discovered that Dr. Kogami had died seven years ago. Inside the van, Kolter showed to Ai and Yusaku the footage of a camera, when a person turned into an Deleted, which happened six minutes before midnight. Ai noted there were no white hands taking the person into LINK VRAINS. Kolter told them the person had not recovered yet, and showed pictures of more Deleted patients in the hospitals. Ai and Yusaku knew this was the same accident with Blue Angel, who was infected by a virus. Kolter believed someone wanted people to be turned into mindless people, but has not find out what happened to their LINK VRAINS' avatars. Kolter showed more data, and Yusaku analyzed all of the Deleted were great Duelists with old-type Duel Disks, and all of them were hackers, too. The trio realized Playmaker, or Ai, were the targets. Yusaku reminded the importance of uncovering the truth behind Lost Incident, and as noted by Ai, they had to stop people from becoming Deleted. Kolter showed a list of possible targets, from which the first was McKendrick Kellenbocker. Later, Kolter and Yusaku watched the Knights of Hanoi Dueling people, and turning them into the Deleted. Yusaku decided to go into LINK VRAINS, even if Kolter believed he would be at a disadvantage, and Ai wished to feel secure. Surprisingly, they saw "Playmaker" battling the Knights of Hanoi, by stopping their programs and tossing them away from their Duel Boards. Dr. Genome confronted "Playmaker", who revealed himself to be The Gore. The latter stated he came to save McKendrick, and knew Playmaker's identity, which displeased Yusaku and Kolter. Kolter watched as Playmaker came to Gore. Later, Kolter and Yusaku went to find who was the Deleted virus' creator. At the van, Yusaku shushed Ai, who was amused to read all the criticism against Kitamura and SOL Technologies. Kolter analyzed that if the Knights of Hanoi took over LINK VRAINS, they'd soon find Playmaker. Yusaku believed they could prevent that by looking into the origins of the Deleted virus. The next day, at the van, Kolter woke Yusaku up, reminding he had to go to school, and promised he'd continue working. After Yusaku returned, Kolter found nothing new. Ai believed Kolter gave up, who replied he was just getting started. Yusaku let Kolter rest, who went to cook some fries and cheese dogs. Yusaku and Kolter ate the food, and watched Blue Angel confronting Baira. Kolter and Yusaku analyzed the videos, and the latter saw Baira behind one of the Deleted. Kolter drove his van to the warehouse district. He took a break when Yusaku went to rescue Naoki. One night, fearing he and Yusaku could soon be in danger, Kolter wrote a report, mentioning the Knights of Hanoi were real people. He named the report as "File No. 1007: Kusanagi Report". He noted the prowess of Playmaker and his allies, but feared the countdown to the day their destinies would change had already started. He also wrote that he still thought of his brother, Jin, and wished that the reader of this report would tell that to his brother when they meet him. He was visited by Yusaku and Ai, who felt something big was about to happen. Kolter served a customer, who told him it would be the last time he would visit the stand, and Kolter suspected the customer would move away. The customer looked briefly at Yusaku, and walked away, with Kolter telling he was also located at the plaza. As the customer walked away, Ai claimed Kolter needed a mascot like him. Kolter replied Ai would make a lame customer, and was interested what was Yusaku doing. Yusaku pointed out the Knights of Hanoi have been purged from LINK VRAINS. Kolter noted that the Deleted incident has been resolved, but also reminded Varis was still out there. Ai thought Varis had retreated, but Yusaku doubted that. Suddenly, Yusaku and Ai felt a pulse within LINK VRAINS, and asked Kolter to scan through the network. Kolter worked on scanning, and just as Yusaku and Ai sensed another pulse, Kolter saw the LINK VRAINS infrastructure changed. Kolter tracked Playmaker's activity, and as the pulse was emitted from the network, Kolter was shocked at the readings. Kolter monitored LINK VRAINS, and found a new reading of energy within the network. Yusaku and Ai joined Kolter, and watched hundreds of tentacles wrapped a beam that was shot in the sky and destroyed LINK VRAINS' cyberspace. Yusaku, Kolter and Ai watched as the tower appeared in LINK VRAINS, causing the cyberspace to be absorbed. Since Yusaku obtained Ghost Gal's data, Kolter promised to look into it. Ai noticed the avatars were being absorbed, and not just buildings or roads - Yusaku knew this was Varis's doing. Kolter analyzed Ghost Gal's data, showing the Tower of Hanoi. Yusaku remembered Varis's words, and deduced if the Hanoi's game was over, the world would be destroyed. Kolter continued analyzing the data, seeing the link between the top, where the LINK VRAINS network was, with the underground erasing system, with the center being the core of the latter system. Ai was shocked, seeing how much data has been absorbed, as Kolter noted that speed has not decreased. Kolter counted six rings would be crafted from this system, one per each passing hour. He realized that once every ring is crafted, a pulse would be sent with high-density data, affecting every machine or program - every piece of technology existing in the world would cease function, as if the world has no computers at all. Ai thought it was safe as long as they did not enter the network, but Yusaku was certain Varis thought of that, and made something that would still erase Ai. Kolter continued his analysis, seeing even devices not connected to the network would also be affected, as an electromagnetic pulse would be sent out, even to erase Ai. While Ai was frustrated, Kolter was overwhelmed, knowing Varis made all of this just to erase an Ignis. The trio watched Kitamura - Akira's successor in SOL Technologies - battling a Knight of Hanoi, named Spectre. They saw how Spectre erased Kitamura, and the former threatened to do this to anyone that dared entering LINK VRAINS. Yusaku swore to stop the Knights of Hanoi, by shutting down the core. Kolter warned him there were no Data Storms in LINK VRAINS, except near that tower. Kolter watched as Playmaker continued on to the Tower of Hanoi, and noticed Blue Angel Dueling Spectre, who defeated Kitamura earlier. He measured five hours and thirty minutes before the Tower of Hanoi was complete. Kolter plays a "Codebreaker" Deck. Sam Black's announcement that he was voicing Kolter in the English dub referred to the character as "Koulter". Black later corrected the spelling. ↑ Yu-Gi-Oh! VRAINS episode 64: "Turning Point"
↑ 4.0 4.1 4.2 Yu-Gi-Oh! VRAINS episode 1: "Link into the VRAINS"
↑ 5.0 5.1 Yu-Gi-Oh! VRAINS episode 11: "Neutralized"
↑ 6.0 6.1 Yu-Gi-Oh! VRAINS episode 12: "Link the Circuit"
↑ 7.0 7.1 Yu-Gi-Oh! VRAINS episode 29: "Kolter's Khronicles"
↑ Yu-Gi-Oh! VRAINS episode 18: "Dueling for Answers"
↑ The English spelling of his first name is unofficial. This page was last edited on 13 March 2019, at 20:10.